YOU KNOW GUNS, and the revolver in your hand is completely familiar. It is loaded with blank cartridges (doubly verified). It is cocked, and your finger is on the trigger. Bill Jordan facing you, six and a half feet tall and over 200 pounds, looks rugged but not fast. His arms are long to match the rest of his frame, and his hands are big. He wears a neatly tailored forestry-green uniform and carries a modern, double action, .357 Magnum revolver. His rig is a Sam Browne belt and holster that looks like those worn by thousands of other police officers all over America. A deep, rumbling voice right out of the Old South says, "When you see me start to draw, pull the trigger. Everything clear now?" He stands easy and relaxed. Sure it's clear! You are ready, and all you have to do is press that one little digit. This will be easy! But from Jordon comes a flick of movement so smooth it looks slow. It tells you to pull, and you manage to trip the trigger—in time with his second or third shot. Many other people have been surprised the same way you were by Bill Jordan's silky-smooth gun handling. I am accustomed to his lightning-fast draw, but he has been surprising me for over ten years, in this and various other ways. chosen because he is convinced that with it, he can score paralyzing hits faster than with any other gun available. Jordan is not enthusiastic about the quick draw with blank cartridges as a test of ability, but it is safer that way. The demonstration, of drawing and firing before even a skilled gun handler can pull the trigger, points out a well known natural phenomenon. The average person's reaction time, that interval between the brain's order to move and the muscle's response, is greater than the time Jordan needs to draw and fire after his hand starts to move. Posing like Hollywood "fastest gun" photo, Jordan holds .45 Colt which he has used to prove he is fastest gun still alive. 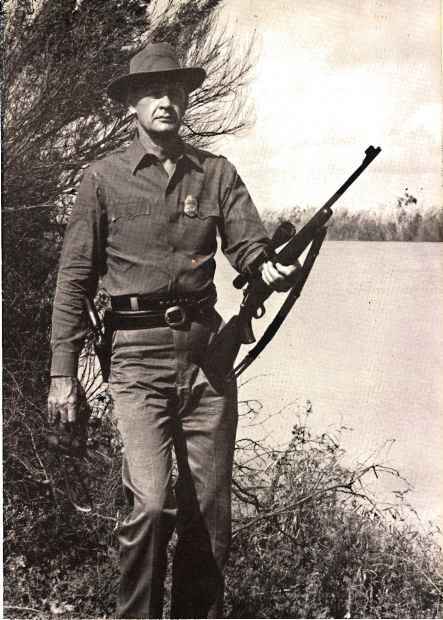 Border patrolman is tops with shotgun, too.